Our look at classic Christmas songs from old Hollywood films continues with Silver Bells from The Lemon Drop Kid (1951). iconic Christmas classic almost wasn't written at all. Songwriting team Jay Livingston and Ray Evans were assigned to write a Christmas song for the Bob Hope vehicle The Lemon Drop Kid, but they weren't too thrilled about the assignment, according to an interview with Philip Furia and Michael Lasser for their book "America's Songs: The Stories Behind the Songs of Broadway, Hollywood and Tin Pan Alley." "It's impossible to write a Christmas song," they remembered telling their bosses at Paramount. "Every year, everybody sings the same old Christmas songs and the new ones never make it." Grifter Sidney Milburn (Bob Hope) and his best girl "Brainey" Baxter ( Marilyn Maxwell) raise some fast cash in The Lemon Drop Kid (1951). The studio bosses persisted and Livingston and Evans eventually came up with a song called, "Tinkle Bells," inspired by a silver bell on Evans' desk and the Salvation Army bell ringers that stand on city sidewalks every holiday season. Fortunately Livingston's wife intervened when he told her the unusual title. "Are you out of your mind? Do you know what 'tinkle' means to most people," she said, according to "America's Songs." So they changed the title to the much more appropriate Silver Bells. Hope's good friend Bing Crosby heard the song while The Lemon Drop Kid was still in production. He liked it so much that he recorded it with Carol Richards and it became a huge hit during the 1950 Christmas season. The original recording is below. 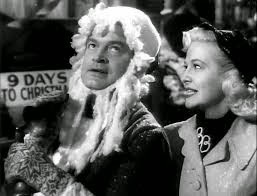 Silver Bells was so successful that Paramount called Hope and his co-stars Marilyn Maxwell and William Frawley back to the studio to shoot an extended version of the song (featured above) for The Lemon Drop Kid. The film is a comedy based on a Damon Runyon short story about a con man Sidney Milburn (Bob Hope), known as the Lemon Drop Kid for his sweet tooth. Milburn needs to come up with some quick cash to pay back $2,000 in gambling debts, so he hatches a variety of schemes, including standing on street corners dressed as Santa Claus while bilking donations from unsuspecting passersby. Since 1951, Silver Bells has become a standard, selling 150 million copies and being recorded by everyone from Alvin and the Chipmunks to Elvis Presley. Even Bob Dylan -- yes, that Bob Dylan -- recorded his own version for his 2009 holiday album, "Christmas In The Heart." I included Dylan's version for your listening pleasure (surprisingly, it's not as terrible as I thought it was going to be). Go here for our look at My Favorite Things from The Sound of Music.